What is a Distribution Transformer. Distribution Transformer is an electrical isolation transformer which convert high-voltage electricity to lower voltage levels acceptable for use in homes and business. A distribution transformer's function is straightforward: to step down the voltage and provide isolation between primary and secondary. Electrical energy is passed through distribution transformers to reduce high-distribution voltage levels down to end-use levels. Nearly all energy passes through at least one distribution transformer before being consumed by an end-use appliance, motor, or other piece of equipment. Distribution Transformers are found in all sectors of the economy: residential, commercial, and industrial. They are generally used for supply appliance, lighting, motorized machine and power loads from electrical distribution systems. They are either ventilated or totally enclosed, and are available with either aluminum or copper windings in standard ratings from 50VA up to 750 kVA. Since small distribution transformers do not generate much heat, a higher proportion of theses tend to be dry-type. Dry-types are less flammable, and are therefore often selected for use when they must be located in confined spaces on a customer's premises. Distribution transformers are used in electric power systems. The final part of the distribution system at medium voltage are the distribution transformers. 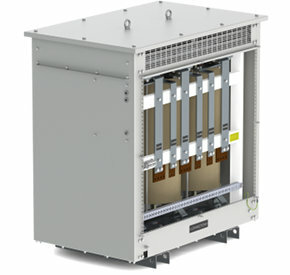 Due to the low impedance voltage, this type of power distribution transformer will not substantially limit the short circuit current in the case of a fault on its secondary side. It is therefore common practice that power distribution transformers have to be type tested to their ultimate short-circuit conditions. Power distribution transformers may be oil filled or dry-filled. Distribution Transformers consist of two primary components: Core and Coil. Coil is a conductor, or winding, typically made of a low resistance material such as aluminum or copper. Copper or aluminum conductors are wound around a magnetic core to transform current from one voltage to another. Liquid insulation material or air (dry-type) surrounds the transformer core and conductors to cool and electrically insulate the transformer. A core made of magnetically permeable material like grain oriented steel. Distribution transformers are either mounted on an overhead pole or on a concrete pad at ground level. There is some evidence to suggest that pole mounted transformers dissipate heat more easily than pad mounted units and may therefore be more fully loaded. ❰ Go back to the previous page.